The Japanese stock market right now is a textbook case of irrational exuberance and central bank stock market manipulation. The weakening yen is much of the same. The Nikkei 225, the leading Japanese stock market benchmark, is up 31.2% since the Bank of Japan announced it was going to ramp up its already existing quantitative easing campaign by another ¥10 trillion ($80.2 billion) a year. And the dollar has appreciated against the yen 13.5%. However, the mechanics of quantitative easing don't really support this kind of movement in either market. As the old axiom goes, "The markets can remain irrational longer than you can remain solvent." And right now, the Japanese stock market and the yen are stubbornly irrational. The soaring Japanese stock market is creating a "wealth effect" that masks the true tragedy befalling the Japanese consumer right now. While the Nikkei 225 recently established new 15-year highs, consumer spending has continued to shrink. The country's population is aging, not spending. 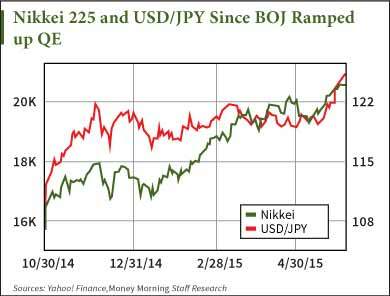 And the falling yen is not because of the BOJ's monetary policy. Traders have hammered the Japanese yen in a speculative attack – selling yen and buying dollars. QE is often mistakenly viewed as a "helicopter drop" of money on the economy or "money printing." But it's neither. Commercial banks are required to hold reserves. This is either in vault cash or deposits held at the central bank or other banks. These reserves show up as an asset on the balance sheet for commercial banks. Also on the asset side of the commercial bank balance sheet are its bond holdings. The BOJ will remove a Japanese government bond (or another qualifying asset under the current program) from a commercial bank's assets. So, the commercial bank's assets will be debited the value of the bond, and that will be credited to the BOJ's assets. Then the BOJ will credit the commercial bank's reserves the value of those bonds. Those added reserves will become a liability of the BOJ but an asset to replace the bond for the commercial bank. This is not money printing. It's an asset swap. The BOJ only rearranges the composition of the commercial bank's balance sheet, and it is all done with simple computer keystrokes on an electronic spreadsheet. The BOJ's balance sheet does expand, but the bank does not truly create new money. If anything, it could be billed as "reserve printing," but that is hardly the same thing. That's because bank reserves do not enter the private economy. Banks draw on these for the purpose of lending to other banks. And while there are reserve requirements, banks aren't constrained in their lending by them. They can make as many loans as they want and then obtain (rather easily) reserves in the interbank market after the fact. The only thing constraining loans are capital requirements and loan demand. And with household consumption falling the last four quarters in Japan, it's becoming increasingly obvious that the Japanese consumers aren't lining up for loans. If anything, QE in Japan adds deflationary pressures to the economy that don't support the current devaluation. When a central bank floods the financial system with reserves, it pushes down rates for banks to acquire reserves in the interbank market. This will spark an economy-wide drop in interest rates as banks will lower rates on their own loans to attract more demand while they play the spread between their own lending and the interbank market. But Japanese consumers aren't taking out loans large enough to expand the money supply in a meaningful way that would stoke inflation. And as all that is happening, the BOJ is pushing interest rates lower, which actually removes yen from the private economy in the form of falling interest income. Japan uses a Primary Dealer system like the US. The dealers buy the bonds from the government. BoJ then buys the bonds from the dealers. The BoJ deposits the cash in payment into the dealer's account at the BoJ. It is money printing because the cash did not exist until the BoJ debited the dealer's account. In double entry accounting the cash becomes an asset of the dealer and a reserve deposit liability of the central bank. Bank Reserves are somebody's cash. They're only called reserves because they are either held as vault cash, or as a deposit at the central bank. As soon as the central bank prints it, it exists in the world commercial banking system. The owner of the cash can deploy it however he or she wants. It exists as an asset entry on the books of the bank, and as a liability on the books of the central bank. It's just like our deposits at our bank. It's a deposit liability of our bank. But it's cash, an asset, to us. Once the BoJ deposits the cash in the dealers' accounts, the dealers then uses that cash for whatever they want. They use some of it to buy more bonds from the Government the following week with the cash that did not previously exist. The Government spends the cash in the next week and it enters the banking system. The dealers don't use all the cash to buy more government bonds. They're dealers. It's their cash. They use it to trade securities, derivatives, whatever and wherever they think they can buy inventory, mark it up and distribute it. The central banks only think they make policy. Ultimately the Primary Dealers make policy based on where they decide to deploy this cash that the central banks print and deposit into their accounts every week. Stocks are one of the easiest vehicles to mark up and sell. The correlation between central bank money printing and rising stock prices is direct because the mechanism is direct. If the dealers aren't buying stocks outright at their prop desks, they're financing their biggest customers' purchases at near zero rates. Works exactly the same as in the US. Also, 13 of the biggest US Primary Dealers are Japan and European governments Primary Dealers. They are counterparties with the Fed, BoJ and ECB along with the government's issuing the bonds. They decide where the cash goes. When the BoJ or ECB print, the ECB and BoJ correspondent dealers can and do purchase not only the securities of their home markets, but also, particularly, the US. The big question now is why, with all the new printed money being pumped into the world liquidity pool, US markets are so flat. The answer lies in a slow shift of confidence. The QE camouflages that but the big boys are tip toeing out the back door while the US stock and bond markets churn. I want to believe what Lee Adler is saying is true, as it makes the most sense, however, if the banks with excess reserves are indeed loaning out these reserves to fuel stock market investment and such, how come the Feds H-4 balance sheet remains unchanged at roughly $4 trillion in excess reserves outstanding? If banks are indeed deploying the excess reserves as Lee states, wouldn't the Feds H-4 balance sheet reflect that?